If you want to plan ahead for the next budget period (or add past budget periods) you can manually add a future or past budget period by editing the Budgets History sheet and using the Budget Analyzer. 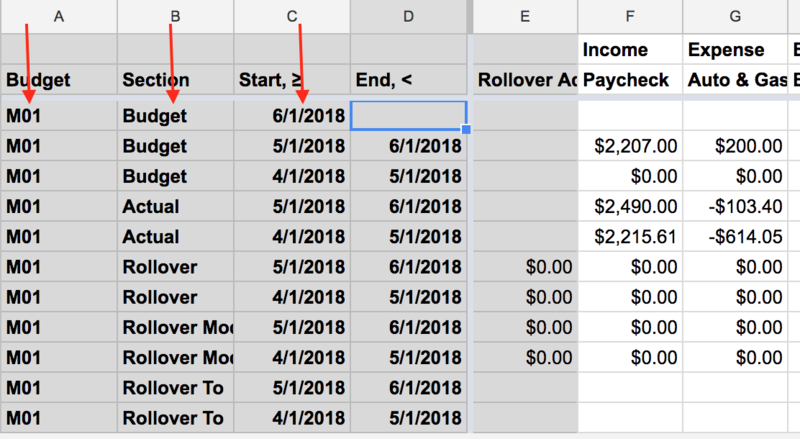 Note: this is an advanced workflow that you may want to experiment with in a COPY of your live Tiller spreadsheet before you commit to the changes due to the way rollovers may cascade forward to future periods, especially when adding past budget periods with these manual steps. Unhide the Budgets History sheet. Use the four horizontal lines in the bottom left of the sheet near the plus sign to see which sheets are hidden. Navigate to the Budget History sheet. Insert 1 row above row 3. You can add multiple lines for multiple periods here if you need to. Decide which Budget should get the future or past budget period. Each budget is given a unique code in the Budget column (e.g. M01 corresponds to the first monthly budget created in this spreadsheet). Enter the budget code into the Budget column that corresponds to the budget you’ve for which decided to create a new period (e.g. M01 or W01). Type Budget into the Section column. Choose Tiller > Budget > Analyze Budgets History. You should then see the additional budget periods appear as an option in the Budget dashboard period selection where you can start editing these budget periods. Note: if you create past budget periods and edit them in their respective budget dashboards you’ll need to run the Analyze Budgets History from the Tiller Add-on menu to make sure the changes cascade to subsequent periods.